Women's Relief Corps of Michigan - An auxiliary of the Grand Army of the Republic, commencing in 1884 in Michigan. 1894 Michigan State Census - Complete Finished Oct. 2000. Highland Township, Oakland Co. Civil War Soldiers - Gives name, birth and death year, cemetery, enlistment and discharge date and unit served in, plus notes. Cemeteries involved are also online and linked from this online file. The all Native American organization from Michigan. Site contains roster, history, and photos. Great solute to the men of this regiment. This site is very comprehensive and you can do online lookups in their data on prisoners of Andersonville! This listing is intended to help promote awareness of those who died in service of their community and country. It contains names from all wars with notes. Features short histories of each Michigan Unit. State of Michigan Archives presentation of all those who substituted for others in the Civil War with both substitutes and principal's names. By Cyndi Howells the author of Cyndi's List and many books. Sons of Union Veterans project. Find the post that was closest to your relative and search the records that are going online. Make sure you bookmark this site! Lot of data on this site if your ancestor lived here. Minister for the 19th Michigan Infantry a transcription of the journal he kept while serving. Has many names and units involved. The Civil War Monuments by county in the state of Michigan. Contains data and photos. A lot of data and articles to read on this site. Over 80,000 names with the Michigan Units they served in are on Don Harvey's site along with history for each regiment. Many lists of members and what happened to them. The National Archives Records Administration - how to get forms to order records for your veteran. A letter home from Decatur Alabama in 1864. A letter of sympathy to a fallen comrade's relatives. 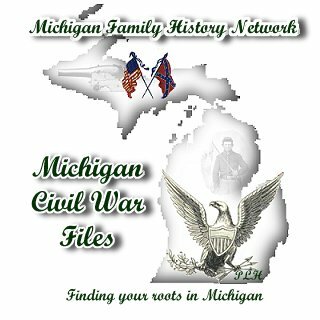 Seeking Michigan has many Civil War documents, photos and records online for you to search through. Now features a search for your veteran's name and you can then look up the company and regiment and film roll for their card. Also has a list of all the soldiers in each company you can look through plus battle history. The soldiers and sailors section has a lot of data online. This organization is preserving Michigan's Civil War heritage. If you are a descendant you can join and help the effort. Sons of Union Veterans of the Civil War - Michigan Department Graves Registration index. A comprehensive site for records online and web sites about the War Between the States. Covers many areas of the US and is a favorite bookmark. History, Roster, Letters, Roll of Honor and more. Record of Service - Entire history online.